I've made so many different versions of enchiladas, from kale and potato, to faux chicken and cheese but these have to be one of my favorite veggie combinations. I made mine with cheddar cheese, which was a first for me, and surprisingly tasted wonderful. 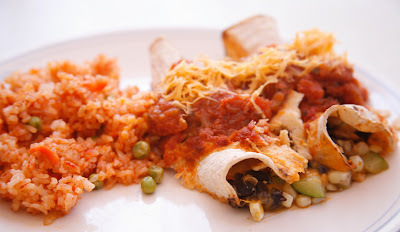 The enchilada sauce recipe is from Veganomicon but if you are short on time, a can of enchilada sauce will work too. But if you can, I highly recommend making the sauce. It's a little spicy and full of flavor..so so good! 1. In a large, heavy bottomed saucepan over medium heat, saute the onions in oil for 4 to 7 minutes, until softened. Add the remaining sauce ingredients, bring to a simmer, and remove from heat. 2. When the mixture has cooled enough, taste and adjust the salt if necessary. 3. Puree with an immersion or regular blender until the mixture is smooth and even. 1. Heat oil in a large nonstick skillet over medium-high heat. Add 2 cups zucchini and corn; sauté for 5 minutes or until vegetables are tender. Remove from heat, and stir in beans. 2. Spread 1 cup Enchilada Sauce in the bottom of a 13 x 9-inch baking dish. Spoon about 1/2 cup zucchini mixture down center of 1 tortilla; sprinkle with 2 tablespoons cheese, and roll up. Place seam-side down in baking dish. Repeat procedure with remaining tortillas, zucchini mixture, and vegan cheese. Spread remaining 2 cups sauce evenly over enchiladas. 3. Cover with foil; bake at 350° for 20 minutes. Uncover; top with remaining cheese. Bake, uncovered, for 10 minutes or until cheese melts. This recipe is for how many servings? 4? Love Mexican food but I have made only Guacamole so far. Oh I'm sorry..it makes 8 enchiladas. 1 tortilla per enchilada. Mmmmmm.... You are making me so hungry! I love Mexican food so much and this looks so good! !